The Stables in Penally, near Tenby sleeps 3 people. The Stables is set peacefully in an elevated position in the heart of the Pembrokeshire Coast National Park, this traditional, adjoining holiday cottage provides guests with a perfect romantic getaway. Situated in the heart of the picturesque village of Penally with its village shop, pubs and restaurants, guests at The Stables in Penally can expect peace, tranquillity and beautiful sea views. The former stable which served the Manor House, dates back to the early 18th century and has been beautifully renovated into a charming retreat, with an open plan living area decorated with a rustic charm and featuring attractive original beams. 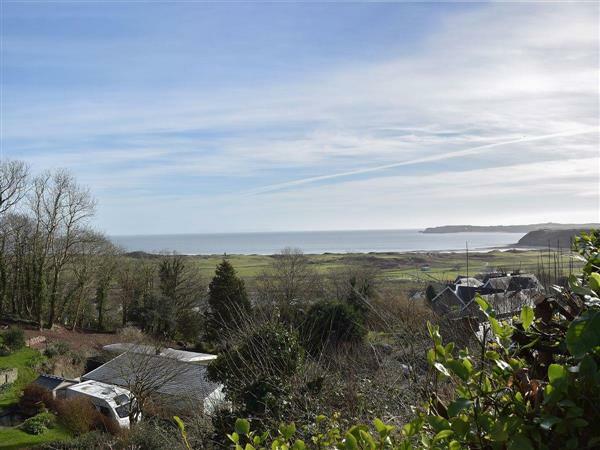 Outside, guests can sit, relax and unwind on the private patio area and enjoy the uninterrupted views of the glistening coast, which captures the off shore island’s of Caldey, Worms Head and across the bay towards the Gower Peninsula. The historic walled town of Tenby, famous for its picturesque harbour, narrow cobbled streets and pastel painted Georgian houses, is a 5-minute drive away, or a bracing 30-minute walk along Tenby’s golden beach. A visit to the resort would not be complete with a memorable boat trip to Caldey Island, with its Celtic monastery and Cistercian monks, who have made it a holy island for hundreds of years. Away from the resort, Pembrokeshire’s historic sites are well worth a visit including Pembroke, Manorbier and Carew castles, as are the numerous charming market towns of Narberth, Haverfordwest and the quaint city of St David’s with its magnificent 12th-century cathedral. There are direct train links from Paddington and Cardiff Central to Penally Station, just 5 minutes’ walk away. Golf and water sports are within easy reach and sea fishing is free of charge (no licence is required). The beach, shop and restaurant are all 600 yards from The Stables in Penally. Spacious beamed living room open plan with contemporary kitchen with breakfast bar, sea views and tiled floor. Shower room with toilet. First floor: Double bedroom. Single bedroom. Separate toilet. Pets allowed at The Stables. The Stables is in Dyfed; should you be on the lookout for a special offer, you can find all the special offers in Dyfed. It's always worth checking to see what is on offer at the moment. Do you want to holiday near The Stables (OV6), you can see other cottages within 25 miles of The Stables; have a look to find your perfect holiday location.